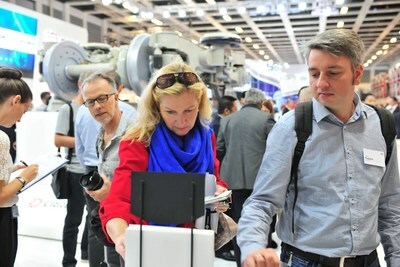 BERLIN, Sept. 20, 2018 /PRNewswire/ — InnoTrans 2018, the world’s leading international trade fair for transport and technology and industrial weather vane for future city development, played witness to the unveiling of CRRC’s latest and most advanced product offerings and transportation solutions yesterday. Under the theme of being the company of choice to “create value with high-tech solutions” within the integrated transportation service industry, the company dazzled spectators with the unveiling of several advanced new product technologies and a series of innovative solutions. 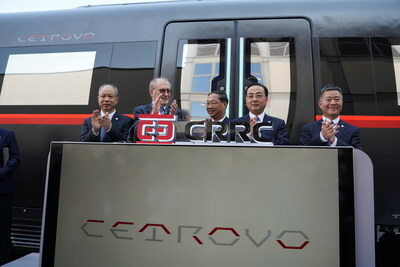 It was also the first time that the company took two real working locomotives over 7,300KM to join the world’s leading transportation technology fair. “Over the past several years, CRRC has aimed to position itself as an ‘integrated rail transit solutions provider’ and ‘creator of value’ to its global customers, transforming from product providers to system solution creators,” said Sun Yongcai, President of CRRC. “Our exhibition at the world-renowned InnoTrans trade fair, our innovative new products, and cost-effective solutions all reflect these two concepts.” CRRC is ranked the largest railway equipment suppliers by turnover in 2017 by SCI verkehr. Under these concepts the company presented their innovations with three key areas in mind gaining time, reducing costs, intelligence and integrating for the future. Alongside the two new locomotives and metro car presented at the outdoor exhibition center the company also launched a series of new solutions for modern growing cities, including a highly versatile high-speed intercity train and cargo car that can reach speeds of 250km/h. The new intercity train offers the option of ease of flexibility during passenger low/high seasons, while the time-saving new freight car can cut down on supply chain costs with a high-volume transportation solution for fresh-food or first-aid materials for disaster relief. With optimization in mind, the company also unveiled, PHM, a sensory “healthcare system” for trains. The forward-thinking new system provides operators with real-time diagnostics and predictions regarding the health of their fleet of trains; improving decision-making and reducing costs through precision diagnosis. 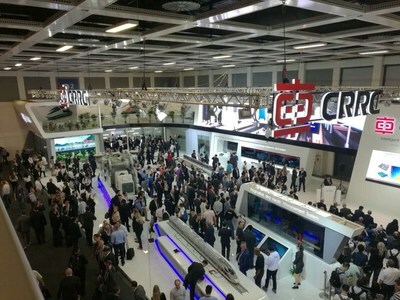 The latest freight solution from CRRC unveiled to spectators at InnoTrans, imagines a world that is interconnected with a transport system to match. By linking up various modes of transport, such as road, air, rail, and sea to one integrated system the company aims to enhance the logistics industry, reduce costs and raise efficiency. InnoTrans 2018 will run from 18-21 September, visit at Hall 2.2/Stand 310! برلين، ألمانيا، 19 أيلول/سبتمبر، 2018 / بي آر نيوزواير / — كشفت سي آر آر سي (شركة القطارات الصينية، “الشركة”)، وهي شركة صنع القطارات الأكبر في العالم، أحدث مترو أنفاق مصنوع من الألياف الكربونية، سيرتروفو، أمام جمهرة من القادة في الصناعة والمتحمسين لصناعة القطارات ووسائل الإعلام في برلين اليوم. وهذا القطار أخف وزنا بنسبة 13% من القطارات التقليدية المصنوعة من الحديد أو الألومنيوم، ما يجعله أخف قطار تصنعه الشركة وأكثرها كفاءة لناحية استهلاك الوقود حتى الآن في الصين. ويأخذ تصميم هذا القطار أيضا المستقبل في الحسبان، إذ هو يتضمن مجموعة من ميزات التصميم “الذكي”، بما في ذلك النوافذ السحرية والمرايا المعززة بشاشات اللمس الملائمة لركاب القطارات في العصر الرقمي. يهدفسيرتروفوإلى تزويد المسافرين “بخدمة ذكية”شاملة وتتضمن مجموعة من الميزات التقنية المتقدمة، بما في ذلك، نوافذ السيارات التي يمكن تحويلها إلى شاشات تعمل باللمس. ويمكن للمسافرين في هذه القطارات مشاهدة الأخبار وتصفح الويب وشراء التذاكر ومشاهدة مقاطع الفيديو والعروض التلفزيونية المباشرة عبر “النافذة السحرية” في سيتروفو.كما يأتي القطار مجهزًا بمرايا تعمل باللمس وموصولة بالإنترنت والمقاعد ذاتية التنظيف وتقنية تقليل الاهتزاز والضوضاء المتطورة؛ ونظام متكامل للمساعدة على السمع ونظام تكييف وإضاءة يمكن أن “يتفاعل” مع الظروف المتغيرة من أجل رحلة أكثر متعة. أكثر من 1،100 نقطة حسية لمراقبة القطار في الوقت الفعلي لتحسين الكفاءة وتقليل تكاليف الصيانة. إذ تهدف إلى “بناء شركة دولية محترمة”، أصبحت سي آر آر سي واحدة من أكبر شركات معدات النقل بالسكك الحديدية في العالم، مع إيرادات مبيعات سنوية بلغت 31.538 مليار دولار أميركي في العام 2017. وهي لديها 83 فرعاً في 26 دولة ومنطقة حول العالم، و13 مركزًا للبحث والتطوير في الخارج وقواعد تصنيع محلية في الولايات المتحدة والهند وماليزيا وجنوب إفريقيا وغيرها، ومنتجات تغطي 104 دولة ومنطقة في ست قارات. VIENNA, The price of OPEC basket of fifteen crudes stood at US$77.06 a barrel on Wednesday, 19th September, 2018, compared with US$76.09 the previous day, according to OPEC Secretariat calculations. The fifteen crudes, from separate OPEC member countries, includes a mix of blends and light and heavy crudes, including the UAE’s Murban.